If you own a laundry center or game center, then you know what it’s like having to count large quantities of tokens or quarters. Sure, you can count them out by hand, but most folks don’t have the time or patience to do this. So many business owners look to purchase a digital coin counting scale. 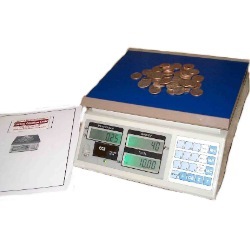 These coin counter scales are designed specifically for counting popular coins like quarters and can be programmed to count unique items like game tokens. When it comes to counting quarters, dimes or other coins or tokens there are two popular scale choices. The Digi DMC-782 and the CCS-60. Both are popular with customers. We like both scales. In today’s article we would like to write about our top choice in coin counter scales, the CCS-60. If your top priority is coin counting, then it’s tough to beat the accuracy and simplicity of the CCS60 coin counter scales. Simply place the coins on the scale and push one button for an immediate count. Often considered one of the best counting scales on the market, the CCS-60 ships to your door already set up for pennies, nickels, dimes, quarters, fifty-cent pieces, and dollar coins. Three customizable keys are available for user-defined coin or token denominations which is ideal for places like arcades. The internal resolution of the scale is more than adequate at 1 part in 600,000. Meanwhile, the 60 pound capacity can handle $1000 in quarters at one time. The scale can operate on standard 110 VAC power or rechargeable battery. The 200 hour battery operation makes this scale perfect for portable situations. The scale also has an optional carry case available that protects your scale. Some of the key features to remember for these coin counter scales are first off, they are fast with easy one button operation. All you need to do is just put the coins on the weigh platform, choose the proper coin type and you’re counting. These CCS 60 scales are perfect for mobile applications like vending route drivers, casinos, car washes, laundromats, amusement centers, arcades and more. The scale features six preset denomination keys: Penny, Nickel, Dime, Quarter, Fifty-cent piece, and Dollar Coins along with three custom preset keys allow for user-defined coin or token denominations for quick and easy recall. Three large, high contrast LCD windows display the Denomination, Quantity, and Total Amount. Accumulation memory feature maintains a running subtotal of the total dollar amount. Tare Feature lets you count in a box, tray, or bucket and allows you to “zero” out the weight of the bucket. Large sixty pound capacity allows for counting a $1000 bag of quarters and the 9″ x 11″ Stainless Steel platter surface provides an adequate surface area for weighing and counting. The coin counter scales operate on 110 volt AC power or rechargeable battery with 200 hours of battery operation for complete mobility (battery included). For portability, the optional carrying case protects the scale when used on the go. Overall, the CCS-60 is a really good choice if you’re in the market for reliable and affordable digital coin counter scales. The scale is a good size and can easily be taken to different locations for weighing and counting if needed. What Wheelchair Scale Do You Recommend? What Industrial Crane Scale Do You Recommend?